While preparing for a trip, whether it's for the weekend or a month, you need to think about the food and drinks that are going to be sitting around your kitchen while you're gone. Items left in the freezer or refrigerator can turn into a disaster if forgotten about. This article will show you how to prepare and empty a refrigerator before traveling. Perishable defines as stuff that is needed to be kept cold or cool at all times and used within a certain time, for example dairy products, fruits, meats, etc. Change the temperature of the refrigerator to 38 degrees Fahrenheit. This will still keep your refrigerator cool for the non-perishable items you want to store, for example canned food, cereal boxes, and other pantry items. It will also save you money since there's not a whole lot coldness building up. Remove melting items from the freezer. Anything that can melt easily will need to be removed, such as ice cream or any kids' Popsicles. 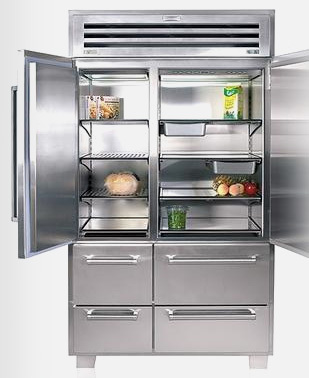 Change the temperature of the freezer to about 5 degrees Fahrenheit or below. Despite having frozen food still stored in the freezer, the temperature will still keep it cold a good period of time and in addition with the refrigerator, changing the temperature will use less energy while you are gone. If traveling more than a few weeks, turn off both appliances completely. Empty both sections out completely (or one or the other if connected). Crumble newspapers and replace your food with the newspapers and a charcoal briquette. This method will work like baking soda stored in the refrigerator - it will help keep mildew, mold, and the smell out. It's best to tape any plugs to the wall or appliance itself to avoid stray plugs or have it drop in a place that you can't reach the cord. Load it up when you return. Remove the newspapers & coal. Do a minor wipe-down or scrub on the drawers and sides. This may be a little annoyed since you would need to buy everything again, but think of this, you would now know that everything is fresh and organized in your freezer/refrigerator.